SUMMARY: When her widowed father and his wealthy girlfriend enroll 16-year old Katy in a boarding school, Katy meets her mother's family, discovers that she comes from a long line of talented witches, and finally learns the truth about her mother's death. 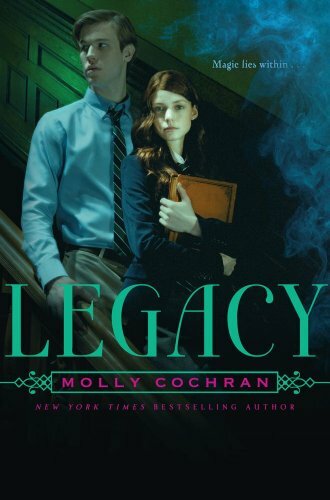 WHAT I LIKED: Parts of the story are fast-paced, and there are several plot threads within Legacy to keep readers interested. Plotlines include Katy's strained relationship with her father and Madam Mim, her budding romance with Peter, her mother's history, the history of the witches and Ola'ea and how they came to the meadow, the Darkness and its reemergence into the community, the mystery of Ola'ea's spell to ward off the Darkness. There really is plenty here to keep readers interested. At times, the story kept me intrigued and rapidly turning the pages. WHAT I DIDN'T LIKE: While I like the story, it drags in places. There were times where I skimmed pages, ready to get on with it already. I felt bogged down with all the mystical aspects of being a witch--Katy's weird dreams, the rituals, the poetry of the spells. It's not that it shouldn't be included--she's a witch after all--but it's just too much for my taste. The romance between Katy and Peter, while sweet, goes way to fast. Peter goes very quickly from ignoring Katy and seething whenever she is around to tolerating her to being madly in love with her. Her mother injured his brother to the point that he is permanently and seriously handicapped. Of course, Katy had nothing to do with that incident, but Peter had stewed about Katy's mother for many years. His acceptance of Katy just happened too fast to be believable. STATUS IN MY LIBRARY: It's not out yet, but I will likely get it. There is a lot of interest in similar book series, so I think we would have some girls who would like it.